Canadian college and university diplomas are recognized around the world. The Canadian educational system encourages cross-disciplinary studies and the development of transferable skills (e.g., critical thinking, teamwork and communications) and uses cutting-edge technology and digital media. Six Canadian universities ranked in the 2016-2017 top 100 for the best universities in the world according to the Times Higher Education World University Ratings. 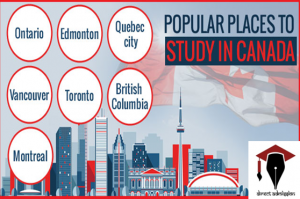 The University of British Columbia (19th), the University of Toronto (21st), McGill University (45th), Western University (67th), York University (75th) and the University of Montreal (100th) all made the cut. The telecommunications, digital media, video game, biotech and aeronautical engineering industries are particularly strong in Canada. In addition, Canada was the first country to link its schools and libraries to the Internet through its innovative SchoolNet program. It is therefore not surprising that nearly 90% of Canadian households are connected to the Internet. In fact, according to a study by the Canadian Internet Registration Authority (CIRA), Canadians rank 2nd in the world for the average number of hours spent online per user (41.3 hours per month). Among G8 countries, Canada takes 2nd place in terms of Internet penetration rates. What’s more, Wi-Fi is accessible virtually anywhere in the country. For example, Montreal has launched an initiative to provide free Wi-Fi across the city. This will make it easy to stay in touch with your family and friends! Take in a hockey match: Hockey is to Canada what soccer is to Europe. It’s more than a national sport; it’s practically a religion! Canada has seven national hockey teams (Montreal, Toronto, Vancouver, Edmonton, Calgary, Winnipeg and Ottawa). To truly experience the frenzy over hockey, you need to watch a match during the playoffs, which generally take place around May. Visit a sugar shack: Mid-march to mid-April is the sugaring-off season in Quebec, when sap (also called maple water) is harvested to make maple syrup. To sample all sorts of treats made with this wonderful product, nothing beats a visit to a sugar shack, a festive place to eat, dance and put on a few pounds! Canada is an extremely vast country: Its surface area is 14 times larger than that of France. It offers a multitude of magnificent landscapes that can be explored throughout the country’s four distinct seasons. Many Canadians complain about the country’s harsh winters, but the cold season provides an opportunity for dedicated skiers and ice skaters to practice their sport in majestic surroundings. Here are just some of the most scenic places to visit: the pristine beaches of Prince Edward Island, the impressive fjords of the Saguenay and the Percé Rock of the Gaspé in Quebec, the fascinating Rockies and Lake Louise in Alberta, Niagara Falls in Ontario, Jasper National Park also in Alberta and Whistler Mountain in British Columbia. From the sea to its mountains, prairies and forests, Canada is an endless source of natural beauty! You can get a scholarship to go study in Canada. The Vanier Canada Graduate Scholarships: Available to world-class Canadian and international Ph.D. students enrolled at Canadian universities, Vanier CGS award grants of $50,000 annually for three years. Concordia University Undergraduate Scholarships: This program offers 193 scholarships to international students pursuing undergraduate degrees in a broad range of subjects and disciplines. Read more about John Molson School of Business at Concordia University here. University of Calgary Graduate Studies Award: This program offers full and partial scholarships up to $40,000 for international students. Read more about the Haskayne School of Business at the University of Calgary here. Brazil’s Science Without Borders Scholarship Program: This innovative program from the Brazilian government started in 2011 and aims to send over 100,000 Brazilians to study abroad in the areas of science, technology, engineering and mathematics by 2015. The government funds 75,000 scholarships while an additional 26,000 are privately funded. Many Brazilians choose to pursue international studies in Canada because of its high quality, accessible cost and bilingual offerings. These are just a few of the financial aid offerings available in Canada. For those just getting started, the Canadian government lives up to its friendly reputation by providing a searchable database of international scholarships. Just enter your country of origin and the database yields a list of opportunities and info on the funding sponsors. You will experience living in one of the most attractive countries in the world. More than 200,000 top international students and researchers choose to study in Canada each year. It’s not just about the hockey. Here are our top eight reasons — give or take a few — why more than Canadian geese flock to Canada.